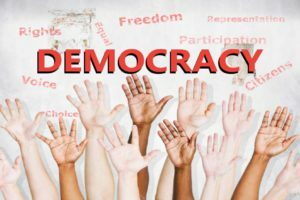 Why then, we may ask, everywhere in the world, he who exercises political functions defines himself “democratic,” ignoring the lexical violence that the word implies – and disregarding democracy’s historical bad reputation. For indeed, democracy, starting with Plato and Herodotus, suggested mediocrity, hedonism, materialism, and a whole range of negative values, reflecting the inferior instincts of the blunt monster with the uncounted heads (2), of the fool multitude that choose by show (3) and of those who love they know not why, and hate upon no better a ground (4). This was the opinion of Joseph DeMaistre the critic of the French Revolution, which he uses as an example of a phenomenon applicable at large. The moments of true democracy and democratic intoxication in the French Revolution were short, ephemeral and destructive. Not much later, the guillotine began working overtime, destroying in the end, even Danton and Robespierre, themselves original architects and masters of the very revolution that destroyed them. And which left in its wake a bloody Civil War leading to an ironic finale. For a movement steeped in blood, and started by finding everything wrong with kings and nobles, ended with finding that there was nothing wrong with an emperor. Returning to our theme, even Rousseau, who examined the subject at length in his book on the Social Contract , concludes that democracy, in its etymological meaning never existed nor can ever exist. In the oligarchic wheels of ascension and declension, participants are but resources to be exploited, with arrogance in the upper regions of the wheels and servility in the lower. In the intermediate regions, arrogance and servility vary dynamically, servility towards those above and arrogance towards those below. And what are the forces that keep the wheels turning? They are illegality and inequality. The epidemic of the “wheels of oligarchy” grows in proportion to social inequality and to the unequal application of the laws. That offence’s gilded hand may shove by justice (5) has been amply demonstrated. And the greater the inequality and social injustice, the greater the demand for patronage, which is the father of protection. Nevertheless, the system of patronage, conditioned though the exchange of rewards and allegiances, cannot be endless. Resources that enable it would have to be infinite. But there are limits to sustainability, typically due to the pauperization of society and to the rapacity of those at the top of the wheels. The pauperization of society is usually not a problem because it is carried out by degrees, on the principle of the poor frog in a water-filled pan and killed by gradually bringing the water temperature to the boiling point. But there are other reasons. The cliques that constitute oligarchies could not exist if everyone would enjoy their privileges. If so, we would then have a democracy, not an oligarchy. To exist, a system of oligarchies needs people who do not belong to it. And for the system to thrive, those outside the oligarchy must be given the hope of belonging to it. This entry was posted in After Dinner Quotes, Amusing Shakespeare, Philosophical, Psychological & Historical Considerations, Psychological Shakespeare, Shakespeare and Politics, Shakespeare on Mass Psychology and Group Behavior and tagged best shakespeare quotes, democracy, iron law of oligarchy, oligarchy. Bookmark the permalink.